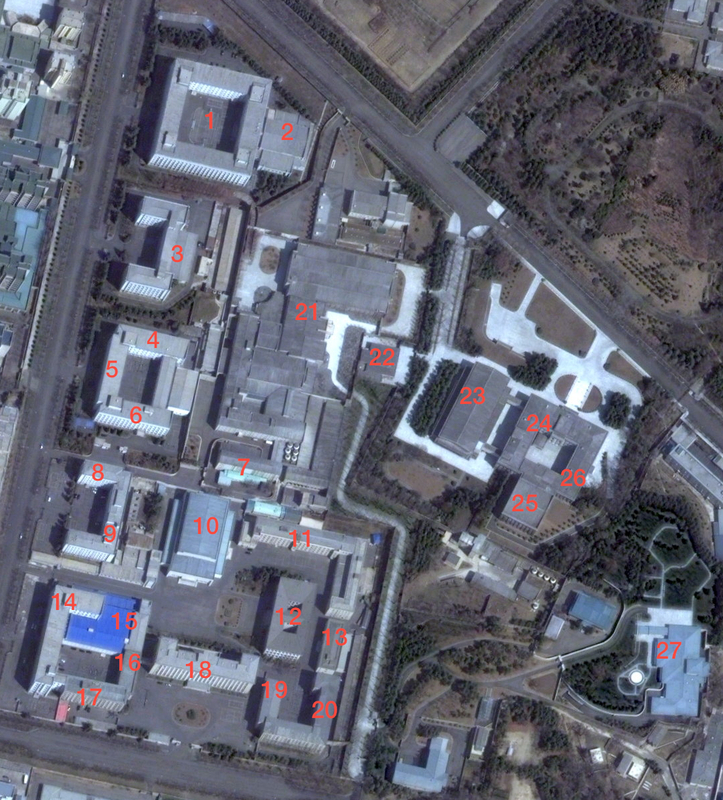 A 15 April 2012 satellite image shows the Korean Workers’ Party Central Committee Office Complex #1 in central Pyongyang. RFA, according to anonymous sources, reports that a new Department of the Economy was established in June 2013 to manage economic policies and personnel. The departments mentioned in this posting that are seen in this image are: the Organization Guidance Department (1) the Propaganda and Agitation Department (2) the Administration Department (7), Economic Policy Control and Finance and Planning Departments (14), Office #39 (15), Office #38 (16), the Machine-Building Industry Department (17), the Light Industry Department (19) and the Finance and Accounting Department (20). The #1 Office Complex also contains a Kim Family residence and banquet hall (21), the Kim Family’s personal medical clinic (22) a conference center and assembly hall (23) the executive offices of Kim Jong Un (24) the Office of Adjutants [bodyguard] (25), the location of late Kim Jong Il’s offices (26) and Kim Jong Un’s official residence (27) (Photo: Digital Globe). 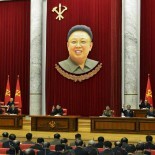 The Central Committee of the Korean Workers’ Party (CC KWP) is the KWP’s chief policymaking body. It has the power to approve political and ideological campaigns and deliberates and advises on government policies (subsequently ratified by the Supreme People’s Assembly or the Cabinet). The Central Committee also vets and approves personnel appointments in the Cabinet and Party, as well as military promotions. To establish the KWP’s power monopoly in the DPRK, the Central Committee’s Secretariat has at least 20 subordinate departments which manage paperwork, provide human resources functions and ensure political security. The Central Committee is elected at a Party Congress. According to the bylaws of the Korean Workers’ Party the CC KWP meets at plenary sessions (plenum) which are required to convene every six (6) months. The plenum deliberates and discusses political and policy issues, conducts bureaucratic and financial housekeeping and makes personnel appointments (electing Politburo Members, Party Secretary or new CC KWP members). The last reported plenum of the Party Central Committee was the September 2010 Plenary Meeting which was held on 28 September 2010. Three power institutions are directly subordinate to the Central Committee. The Political Bureau (Politburo) is responsible for managing policy and ideology. According to the KWP by-laws, the Political Bureau “directs all the party’s political work.” The Central Control Committee (Commission) regulates party membership and disciplinary matters. The Secretariat is responsible for implementing and enforcing the party’s decisions, through 20-odd subordinate departments (i.e., Organization Guidance, Propaganda and Agitation, Financial Planning). 23. The party Central Committee directs the work of the party between party congresses. The party Central Committee firmly establishes the monolithic ideological system for the entire party, organizes and directs the party to carry out party policies, strengthens the rank and file of the party, directs and supervises the administrative and economic work of the party committees at every level, organizes revolutionary armed forces and enhances their fighting capabilities, represents the party in its external relations with other political parties within and outside the country and manages the finances of the party. 24. The party Central Committee shall convene a plenary meeting of its own at least once every six months. The plenary meeting of the party Central Committee discusses and decides important issues of the party; elects the general secretary, secretaries and members of the Political Bureau and its Presidium; organizes the Secretariat of the Party; and elects members of the Military and Control committees.